We’re publishing the article just minutes before the last World Cup fixture at Arena Fonte Nova. We don’t know the score, but know that the stadium will soon again become home to SC Bahia and numerous events of local, regional, national and international scale. We’re discussing the design with Claas Schulitz, architect behind the arena. 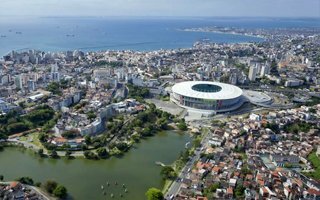 StadiumDB.com: The location by Dique do Tororó, so close to the ocean and within the historical part of Salvador looks stunning. But a place like this has its constraints. What were your main challenges with shaping this stadium? Claas Schulitz: There were two constraints that were extremely challenging: The size of the site and the topography. Due to the restricted space on the east-west axis it was difficult to accommodate all functions necessary for a FIFA-Stadium in the building, but we succeeded. Furthermore, the topography was the difficult to handle. The stadium was built adjacent to a hill, resulting in various entry levels. Visitors coming from the south follow ramps from the level of the lake (Level 1) to enter the stadium on level 3, whilst visitors in the north enter on level 5. The VIP entrance – located in the west – is even higher on level 7. As if this wasn’t challenging enough, there’s also the issue of parking capacity and segregation of home/away fans in league football. How did you manage to meet expectations in these aspects? Indeed, these issues were difficult to solve. The stadium holds about 800 parking spaces inside the stadium footprint and about 1000 parking spaces in an external parking building to the northeast of the stadium. Access to the parking spaces is on level 1 in the south, the exit is in the north approx. on level 7, reached by a ramp. Photos of certain rows in upper parts of the stadium circulated the internet showing very limited legroom for fans. Is this a result of the plot’s constraints that you mentioned? No. The depth of the rows were designed in accordance to various recommendations, incl. FIFA. Unfortunately, the client installed seats that are much larger than average stadium seats without consulting the architect. Initial renderings of the new Fonte Nova suggested the stadium might have a running track. Was this part of the plan at any phase? In our initial competition proposal in 2008 we believed the city wanted a running track and proposed an athletics stadium as well as a dedicated football stadium. In various talks and discussions following the competition, the running track was discarded, not only to improve Salvador's chances to host the World Cup, but also because the City stated that there was no need for an athletics track. So it might seem you corrected what was ‘wrong’ with the old stadium by reducing it to football use. But the stadium remains elliptical as far as the seating layout is concerned. Why this shape and why three tiers? It was important for us to deliver a "round" stadium, not only because of better views to the pitch and a better atmosphere, but also because the roof design with the compression ring requires a round form. Transforming a rectangular form of a pitch to an oval stadium was a great challenge. From a geometric point of view, Arena Fonte Nova holds more than 60.000 spectators, considering the missing seats in the southern opening. In order to ensure good visibility from all seats and all functional requirements (e.g. sky boxes, business lounges and press areas) three tiers are the best option for a stadium of this size. During the World Cup the southern opening has temporary seating, but in regular use it proved to be a great hub for various events, including sports, fashion and concerts. Was it planned as a multi-use space from the start? It was our idea from the beginning to use the space for events and give the operator the chance to prepare the stage for an event during football matches. However, we never anticipated that the open space would be such a success - the area is constantly being used for various events! Your company already designed a World Cup stadium, back in Germany. From your experience, how much has changed in this kind of projects between then and now? Apart from technical changes (e.g. HD-television resulted in more lighting having to be installed to illuminate the pitch), the demands for hospitality and VIP areas have been increased. All in all, FIFA's technical recommendations have evolved from a simple description to a professional booklet. Some people claim that such strict regulations and changing business models for stadiums lead to modern World Cup arenas becoming more unified, less friendly for passionate atmosphere. But your stadiums for both Hannover 96 and EC Bahia seem to give good conditions for vociferous fans. For us, it was very important to keep Brazilian stadium tradition alive and not design a "European" standard stadium. On our first visits to Brazil, we were impressed be various stadiums built in the form of a horseshoe, e.g. Pacaembu + Palestra Itália (São Paulo), Pituaçu and the former Fonte Nova (Salvador), similar to the stadium of the first Olympics Games in Greece in 1896 (Panathinaiko Stadium). It was clear to us that the traditional horseshoe form must be incorporated in our design. As noted above, we also believe that an oval / round form is good for a better atmosphere in a stadium. Claas Schulitz - German architect born in Santa Monica, USA. Graduate of the Munich Technical University. Designer of, among other, the HDI-Arena in Hannover, the Eintracht-Stadion redevelopment in Braunschweig and the above discussed Arena Fonte Nova.